Bison Coolers formerly went by the brand name Brute Outdoors or Brute Coolers. They are the same great company, offering the same great coolers, just with a new name. You can always find us grilling up a storm with a cooler full of cold brews outside of our favorite college football games. As tailgating enthusiasts who have a major disdain for warm beers, we have tried nearly every high-grade cooler and Bison Coolers are always one of our favorites for a multitude of reasons. If you like your premium coolers homegrown in the USA, then Bison Coolers should be among your top choice. Bison Coolers are as rugged as the outdoors themselves, which is why they are built with precision and scientific thought to ensure that they can withhold to an outdoorsman’s expectations. So what exactly does an outdoorsman or tailgating enthusiast expect from a top-notch cooler? Obviously when first deciding on what cooler works the best, the first question people will have is: how long will the cooler keep the ice frozen? In the market for high end coolers, the battle always begins with having the better ice retention than the competition. 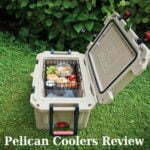 Yeti Coolers, Orca Coolers, Pelican Coolers, & K2 Coolers are all formidable opponents in the outdoor coolers category. Bison Outdoor Coolers promise to keep ice solid for 5 days, and we can say from experience that they deliver on this promise. We have gone on extended, 7-day-long camping trips in the summer before and we didn’t have to replace the ice until towards the end of the trip. Bison Outdoors Coolers says themselves that there have been reports of over 10 days of ice retention in the past. Secondly, when determining whether or not a cooler is worth purchasing, it is worth checking out how the cooler was constructed, because a poorly constructed cooler isn’t going to last very long. Like most high-end ice chests, Bison Outdoors Coolers are created using the coveted Roto-molding process. Roto-molding creates seamless, hollow products that are void of pesky parts that can dismantle easily. This thickness of the walls means that Bison Outdoor Coolers can take a hefty amount of damage and not even come out with a scratch. We also like to choose which manufacturers we trust by evaluating how they treat their customers and Bison Coolers also gives top customer service with their amazing 5 year warranty with the purchase of all models of their coolers, other than their SoftPaks model, which comes with a 2 year warranty. We are folks that enjoy buying accessories with big purchases and Bison Coolers have some really useful accessories that you can buy with your cooler. You can get everything from haulers for your large Bison Coolers to strap and tie-down kits to properly secure your cooler if you are in motion. Probably the coolest and most innovative accessory that you can get with a Bison Cooler are the seat cushions. Available in both white and camouflage, you can turn your Bison Cooler into a comfortable seating space for your camping trip, tailgating session or anywhere that you might need to have a seat while enjoying the contents of your cooler. The Bison 50 QT cooler is perfect for any standard tailgating party, fishing trip or family barbecue. The Bison 50 QT Cooler is a great boat cooler and is big enough to fit a decent amount of food and drink, while taking up a small part of your boat or car, making it the optimal size for everyone. Although the Bison 50 QT Cooler is the most popular size among fishermen and tailgaters, Bison Coolers has a nice arsenal of different sizes to adjust to many different occasions. For instance, the 12 Can SoftPak is perfect for a solo or dual outing to a park or to a small picnic, but the massive 150 QT is amazing for large graduation or wedding parties. No matter what the occasion is, you can find the size of a Bison Cooler that fits your needs. It is strongly suggested that you only purchase Bison Coolers from authorized retailers, or straight from Bison themselves. In fact, you can’t find Bison Coolers for sale just anywhere. Obtaining a Bison Cooler from unauthorized retailers such as Amazon or eBay voids yourself from the warranty and leaves you susceptible to scams. For a list of authorized retailers that have Bison Coolers for sale, take a look at the Bison website. As a special offer for DiscountCoolerSales.com readers, we have arranged a special $15 off code to be redeemed on the Bison website. Click here or the image below to get the code. 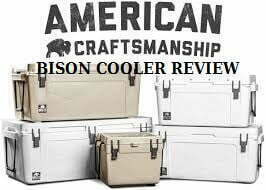 Be sure to check out our other cooler reviews of brands such as Grizzly Coolers and Polar Bear Coolers. Thanks for visiting Discount Cooler Sales!